Now, the wait is over, Xiaomi Redmi series lovers are getting a good news. 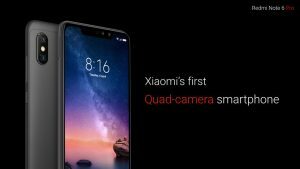 Today Xiaomi India introduce their anticipated Redmi Note 6 Pro at launching event and their slogan was “Meet our new Quad camera all-rounder – Redmi Note 6 Pro”. The smartphone comes with dual front-facing cameras, bigger and brightest display than the previous Redmi Note 5 Pro. First, Xiaomi’s Redmi Note 6 Pro runs on Android 8.1 Oreo operating system with 1.8 GHz octa-core Qualcomm Snapdragon 636 processor. Second, This phone comes with 6.26 inches notch full HD+ IPS LCD 1080×2280 pixels display. Third, Its battery, Xiaomi’s Redmi Note 6 Pro gives you all day long 4000mAh Li-Polymer strong battery backup and 10W super-fast charging support. Fourth, Redmi Note 6 Pro inside 4/6 GB of RAM and 64 GB of internal storage. Storage on the handset is expandable via micro SD card up to 256 GB. Fifth, Camera fact. Redmi Note 6 Pro comes with 12+5 megapixels rear dual AI cameras and 20+2 megapixels front facing AI selfie cameras. And this phone available on three Colors – Black, Rose Gold & Lake Blue. The Redmi Note 6 Pro price in India starts at Rs. 13,999 for the 4 GB of RAM with 64 GB of internal storage (roughly Bangladesh price BDT19,490) and Rs. 15,999 for the 6 GB of RAM with 64 GB of internal storage (roughly Bangladesh price BDT22,990). Though the Redmi Note 6 Pro smartphone not launched yet in Bangladesh but may be within very short time Bangladeshi Redmi smartphone fans can collect from the unofficial store like Bashundhara city or Jamuna Future Park shopping mall. After launching this model in India within very short time Xiaomi Bangladesh also officially launches Redmi Note 6 Pro in Bangladesh.